Giverny is a small French village 80 km to the west of the capital city Paris, within the valley of the river Seine and the northern region of Upper Normandy. The village is best known as the rural retreat of the Impressionist painter Claude Monet (1840-1926). Monet moved to Giverny in 1883 with his family, including his second wife and 8 children, living and painting here until his death in 1926. The village surroundings and the gardens of his house formed a great part of the inspiration and subject matter for his paintings. It was after the move to Giverny that Monet began his famous Séries of paintings, repeatedly rendering haystacks, cathedrals and waterlilies from his garden pond in his own unique Impressionist style. Take the A13 from Paris to Bonnières, then the D201 to Vernon, where you cross the river Seine. Look for signs. The bicyle can be rented from a cafe right outside the train station and is indicated by a sign. The rental fee is around 12€ and the bike ride is about 4 mi with a map provided by the cafe. Bus and minibus trips run from Paris to Giverny as a half-day tour and to Giverny and Versailles as a full-day tour every day except Monday. It is always best to arrive early in Giverny in order to avoid the throngs of bus-driven tourists who arrive later in the morning and keep coming all day. Monet's House (Fondation Claude Monet) , 84 rue Claude Monet, tel 02 32 51 28 21, open April-October Mo-Su 9:30 am - 6 pm, admission €9.00, €5.00 students, €4.00 disabled, under-7s free, wheelchair access available - e-tickets can now be purchased online to avoid queuing - the house is quietly eccentric and highly interesting in an Orient-influenced style, and includes Monet's collection of Japanese prints. There are no original Monet paintings on the site - the real drawcard, is the gardens around the house - the water garden with the Japanese bridge, weeping willows and waterlilies is now somewhat iconic. Monet's house has the obligatory gift-store attached, designed to help you part with your money in exchange for all manner of things Impressionist. 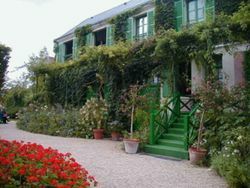 the Musée des Impressionnismes Giverny , 99 rue Claude Monet, tel 02 32 51 94 65, open May - October Tu-Su 10 am - 6 pm, admission €6.50, €4.50 12-18s and students, €3 7-12s, under 7s free, wheelchair access available - the museum replaces the former Musée d'Art Américain. It proposes temporary exhibitions. The Natural Mechanical Museum , 2 rue Blanche Hoschedé-Monet, Phone: 02 32 21 26 33. 27620 Giverny. Association under 1901 law, founded by the Guillemard brothers: Jean-pierre, René and Gérard currently run restorations and exhibitions with the help of an enthusiasts team who devoted their time and known-how to the Patrimony preservation. The museum origin is a private collection of steam internal combustion engines; founded in 1955 by the Guillemard family a GIVERNY resident's since generations. Former threshing entrepreneur and blacksmith ADOLPHE Guillemard has transmitted to his children his know-how and passion for the vintage mechanies. Along years, purchasing, donations of engines pile-up awaiting for the needed parts or just a time to restore. Since 1982 the number of collected items inereased due to closing of workshops, factories or mills. The preservation of these engines was a rescue task, numbers of testimonials items already gone. In 1990 the collection find home in the actual local where the engines are in permanent show, installation of the Carels 1908 diesel engine weighting 28 tons keep the team busy for months on overhauling and restoration; it becomes in 2003 the world bigger old running diesel engine. It is recommended that you take a guided tour to make the most of your visit to Claude Monet's house and garden at Giverny. 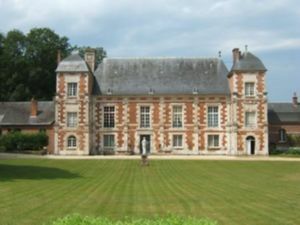 If you are coming from Paris, you might wish to take a bus or minibus tour which provides a tour-guide. If you are coming on your own, you can book a guided tour in English, French or German, offered every day, by appointment only. If you are feeling energetic, try hiking one of the nature trails that wind through the hills above Giverny. The panoramic views of the village, the Seine valley, and the neighboring town of Vernon are quite stunning to see unfold beneath you. Two of the area's trails start at a signboard behind the city hall, found just up Rue Blanche Hoschedé-Monet. Make sure you're wearing sturdy shoes or boots and are in relatively good shape, as some sections of the trails on the forested hillsides can be very challenging. Carrying water and insect repellent might also be a good idea, depending on the weather. Information on other scenic hiking trails can be found at the Tourist Bureau in neighboring Vernon. 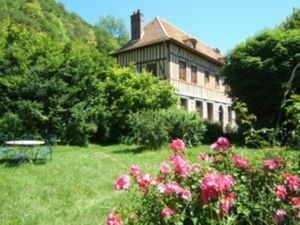 The nearby Forêt de Bizy is also a lovely place for a picnic or nature walk, and is a good way to get away from the crowds which sometime descend on Giverny. There is a small restaurant attached to Monet's House (beware tourist trap prices and overcrowding) and a few reasonable options in the village &. A wider choice can be found in the surroundings . On a fine day, bringing a picnic lunch with you might be a better option - walk up out of the village along some of the small lanes  for a change from the crowds. There are a number of bed & breakfast options in the village  and surrounds . This village - or many others along the Seine valley nearby - could provide an ideal base for further exploration in Upper Normandy. In Giverny area there are also 4, 3 and 2 stars hotels. 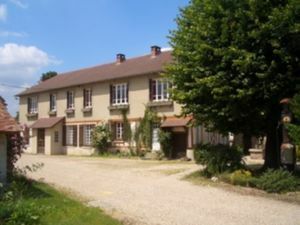 If you are just stopping at Giverny on your way, a map of Giverny area Hotels and one of Giverny area B&B may help you find the perfect location for your stop. In order to complete the Monet experience, travellers might like to visit the neighbouring town of Vernon, (castle, medieval streets, Museum with paintings by Giverny artists, including Claude Monet, 17th-19th c. mansion and much more) or journey on / back to Paris, or to Rouen and the Seine valley, where they can see further examples of his work at various venues. This page was last edited on 25 January 2018, at 19:20.